Locating the best printing company for your business can be tricky. But it is a process worth putting some thought into. There are many factors to consider when shopping for a new printer. Taking the time to find the right fit will reap lasting benefits for you and your business. Here are a few things to think about when choosing a print partner. The old adage of you get what you pay for is true in many aspects of life and certainly holds true for printing companies as well. Companies that charge higher prices than their competitors aren’t doing so because they need fuel for the company jet or want to buy a new Bentley. Their prices are higher because they are producing a higher quality product. Just like in your business, having cutting-edge equipment and a top-notch staff is expensive. But those things help you produce your best work, do it faster and finish jobs accurately the first time. Sometimes you don’t need that. Quick and dirty jobs can be done by most any printer. But when you need quality, on-time work, you’re probably going to have to pay for it. When comparing costs between different printing companies, be sure you are getting the full picture. Hidden costs like setup fees and shipping and handling charges can make what seemed like a good deal end up sinking your budget. Always ask your print provider to provide a detailed written estimate so you know exactly what you will be paying when the job is completed/delivered/installed. Want your work done by a fly-by-night operator with low-budget equipment and no quality standards? Probably not. But as you take to the internet in search of a printer, you are bound to find plenty of these types of companies offering bargain basement prices and lots of promises. Unless you are printing low-quality throwaway items like concert flyers for your weekend death metal garage band, you probably want something a little more upscale. Always grill any prospective printer on their quality practices. Ask to see examples of high-quality work they’ve produced that is similar to what you will be buying. Any print company worth their salt will be happy to show off their excellent work if, in fact, they are doing excellent work. Above all else, check for this history of quality to make sure you know what to expect from a new printer. Ask to see examples of high-quality work. Seeing past work is a great way to gauge the capabilities and standards of a prospective print partner. But what about your project? How can you know it will be produced to the same standards as the sample work you viewed? Most companies will provide proofs of your print job before the full project goes to press. Be sure to find out if this service is included and how accurate the pre-production proof will be to the final project before you sign off on any large job. If you are going to spending good money on printing, you’re going to want some guarantee that the work will be up to snuff. Most print jobs involve custom specifications and detailed instructions. These are the things that help get your job done right. Having a printing company that is invested in excellent customer service is crucial. You want a person that you can talk to, who will understand what it is you are trying to create and who can capture all of the details for a job and communicate them to the production team with no mistakes. This ability to communicate what you want with the people who will ultimately create it is of utmost importance. This is where finding a printer with whom you can build an on-going relationship is beneficial. 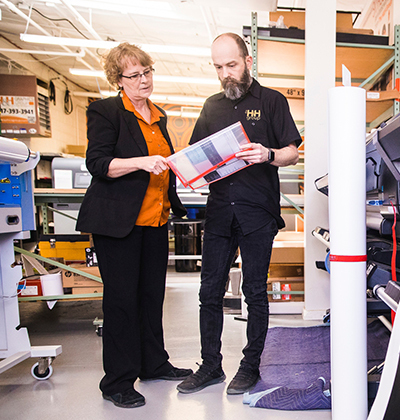 When you have an established rapport with your printer, you can rest easy that your jobs will be produced accurately to your specifications every time. This peace of mind is something you will definitely want from your printer. You want a person that you can talk to, who will understand what it is you are trying to create. A printer that can handle all of the different types of products you will need can be a boon to you in terms of time savings and lower stress levels. If the printer you select can produce your sales flyers, make the window signs you want, and can also handle getting custom shirts made up for your crew, you can save a lot of time and hassle. Dealing with one vendor for a wide range of products saves you the headache of dealing with multiple companies and trying to navigate the requirements and schedules of each. 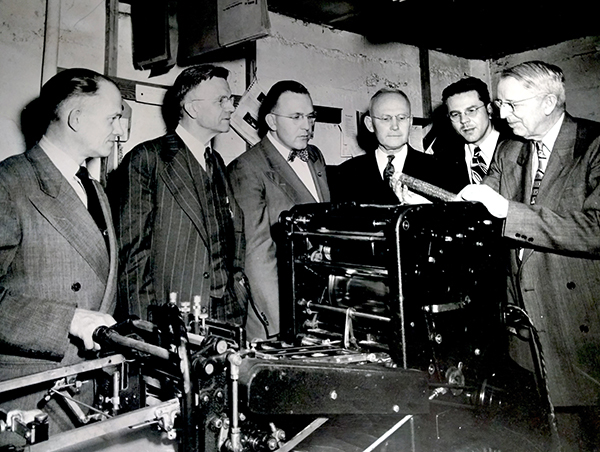 Asking up front what types of jobs your new print provider can handle is worthwhile. Even if you don’t need additional products right away, knowing that your printing company can take care of those things for you when you do need them takes that responsibility of finding additional companies to work with off your plate. We are proud to serve businesses in Lancaster, PA. Our customers are companies founded by, frequented, and staffed by our friends, families, and neighbors. We love this tie in and the warm feelings that come from being a part of a close-knit community. As a company, we are always looking for ways to help others. And we take pride in producing quality work that will be seen around town. Community involvement may not be the biggest factor in choosing a printing partner, but we think it’s an important one. If you feel the same way, we urge you to look for a printing partner who shares these same values. We take pride in producing quality work that will be seen around town. Being part of the Lancaster, PA community isn’t a requirement for doing business with us by any means. We have happy customers all over. But we do feel it makes sense to partner with a local company when possible if that company can consistently produce the things you need in a way that makes you happy. Interested in checking out our commitment to quality on quick-turn work? Want to hear more about our focus on supporting local businesses? Want to tell us about your organization and how printing could benefit you? Give us a call @ 717.393.3941 and let’s have a conversation.